Christian was an active and loving 3-year-old when diagnosed with a malignant brain tumor (Medulloblastoma) on July 15th, 2005. Christian was rushed to Children’s Hospital Colorado where his family was met by Dr. Foreman and Dr. Handler. Within a few days of diagnosis, Christian underwent an eight-hour surgery to remove the tumor at the skilled hands of Dr. Handler. He then stayed in the hospital for 2 ½ weeks to recover. His roller coaster ride continued when cancer cells were found during a spinal tap performed on August 3rd of that same year. 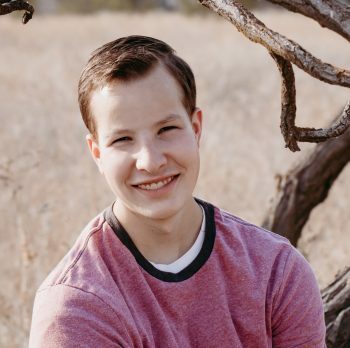 Christian underwent a six-week high dose radiation and chemotherapy treatment cycle at the University of Colorado and Children’s Colorado, which he finished in September of 2005. Christian repeated a chemotherapy cycle every six weeks, the last of which was completed in September 2006. At this point, Christian’s prognosis is very good thanks to Dr. Foreman and the amazing staff at Children’s Colorado. Christian has benefited from the research funded by The Morgan Adams Foundation. His last MRI performed was on October of 2017 and showed no signs of cancer. Christian is a sophomore this year. He’s a happy, hardworking, easy going 16-year-old who loves life. His passion is writing stories. He created a character named “Skeleton Man” and is currently working on completing his first book. He has continued with the Boy Scout program and is currently working on his Eagle Scout Project which he hopes to complete this fall. For his project, he shared his cancer story in front of about 120 children (ages 8-11) and adult leaders from our church. He had the kids help him make hats, jeweled tiaras, and wands to donate to kids fighting cancer. He also collected toiletry items from our community to donate as well. He will be donating these items in October to the children at Sacred Heart Children’s Hospital in Spokane, WA as he goes in for his yearly MRI. He participates in high school cross country and track. His goal this year is learning how to drive and getting his driver’s license. Though many things are much harder and take him a little longer due to late effects from therapy, he never gives up. He’s our hero. The Morgan Adams Foundation funded the Micro Array Chip that differentiated Christian’s cancer and allowed Dr. Foreman’s team to develop a modified treatment program to aggressively treat it. MAF Impact: Collaborative collection of chip data, including Children’s Hospital Colorado, has enabled us to realize that even children with metastatic disease can be cured with the application of modified therapy.